Well, this one is graded so it speaks for itself! As always, see my feedback so you can know that I always take care of my customers. I pack them in a box with bubble wrap. 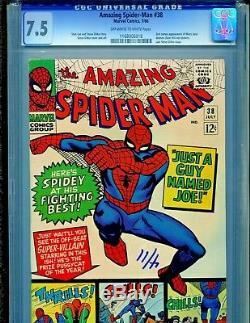 The item "Amazing Spider-Man #38 Marvel Comics 1966 CGC Graded 7.5" is in sale since Tuesday, January 09, 2018. This item is in the category "Collectibles\Comics\Silver Age (1956-69)\Superhero\Spider-Man".